As we tick into the second quarter of 2019, one of the biggest thrillers of the year so far in Australia & New Zealand is being released in the US and the UK. CALL ME EVIE is a true slice of #SouthernCrossCrime (Australian & New Zealand crime writing) as it's set in both the bustling Australian city of Melbourne and a remote rural community in coastal New Zealand. Plus the author himself has called both countries home, growing up on a horse farm in the Bay of Plenty before moving across the Tasman to Melbourne as an adult. As I interviewed JP Pomare for a large feature in the New Zealand Listener in January, I didn't review the book at the time, instead publishing a review from top Australian crime aficionado Karen Chisholm here on Crime Watch. 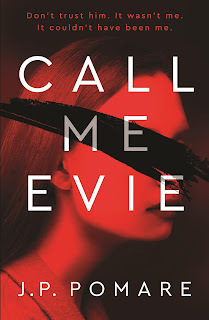 Given CALL ME EVIE has recently been published in hardcover in the USA and is about to be published in hardcover in the UK (already out in ebook, for British readers who can't wait), I thought I'd share a few of my own thoughts on this debut 'literary thriller' that's a pretty damned good read. If unsettling tales delivered by an unreliable narrator are up your alley, then CALL ME EVIE is a book you should rush to. While JP Pomare now hails from the same locale as modern-day Australian queen of crime Jane Harper, to me CALL ME EVIE Pomare is a superb twist-filled chiller much more akin to the early novels of Gillian Flynn (eg DARK PLACES) than Harper's Outback tales. Kate Bennet is a seventeen-year-old whose life has been turned completely upside down, though she can’t remember all the details of how or why. She thinks something very bad happened to her recently, and now she’s spent the past fortnight living far away from her suburban Melbourne home in a cabin in a seaside backwater in New Zealand. She's not there by choice. There’s a man who says he saved her and helped her escape after she did something terrible, and now he’s trying to nurse her back to health. Her memory is fractured, and he’s concerned about what she remembers, but is he trying to help her remember, or ensure she forgets? Can Kate trust him? Can she even trust herself? Pomare adroitly shifts reads between present and past, between ‘before’ and ‘after’ the mysterious life-changing event which lies at the heart of Kate’s plight. But is the teenager a victim or a villain? Would it help or hurt if she could remember? CALL ME EVIE is nerve-jangling psychological thriller infused with literary flair, troubling characters, and a strong sense of place. The reader isn't quite sure where they stand, and there's some beautiful storytelling sleight of hand that feels natural and authentic, rather than forced. Even feeling suspicious throughout, Pomare manages to surprise, and builds to a courageous conclusion that eschews any 'pat' endings. Overall, CALL ME EVIE marks the arrival of a strong new voice who offers something distinct and rather stand-out among the recent sea of psychological thrillers. Recommended. Craig Sisterson is a lawyer turned features writer from New Zealand, now living in London. In recent years he’s interviewed hundreds of crime writers and talked about the genre on national radio, top podcasts, and onstage at books festivals on three continents. He has been a judge of the Ned Kelly Awards and the McIlvanney Prize, and is founder of the Ngaio Marsh Awards and co-founder of Rotorua Noir. You can heckle him on Twitter.